Clinic with Gym & Floor Exercises at AD Center, 113/4, Hazra Road, Kolkata - 700 026. - Adjuvant treatment (with medicines) for Diabetes, High Blood Pressure, Thyroid, Arthritis, Spondylitis with regular medical checkup. - Workout & weight training for increasing stamina and power. - Ante – natal & Post- natal exercises. Being the leading tennis academy, we offer a world class collection of Table Tennis Accessories for our customers. These Tennis Accessories are procured from the certified manufacturer of the market. Our table tennis accessories earn huge accolades in the market for their superior finish, reliability and longer service life. Yoga & Meditation for overcoming addiction. Physical fitness comprises two related concepts: general fitness (a state of health and well-being), and specific fitness . Physical fitness is generally achieved through correct nutrition, exercise, and enough rest.Fitness was commonly defined as the capacity to carry out the day’s activities without undue fatigue. Keeping in view the changed and varying requisites of our privileged clients, we are readily engaged in presenting Quarterly Personal Training Services. Owing to their cost effective rates, promptness and reliability, these services are delivered by some of the deft and adroit personnel. Personal Training at Club Xcell meets your specific needs and target. After a consultation with the trainer, where your goals and aspirations are discussed a routine designed to help you achieve your targets. These sessions are individual and timed as per your convenience. Diet counseling also provided. POP Pilates is a total body, equipment-free workout that sculpts a rock solid core and a lean body, while leaving no muscle untouched. Sweat to moves choreographed to your top 40 favorite hits. Join the POP Army! Certified trainers are available to guide members through specialized programs. Personal trainers guide, motivate and make sure the member adheres to their program. The trainers are constantly updated on latest techniques through visiting Measure’s Gym trainers. These trainings cover the broad aspects of yoga, important of Asanas in our day to day life and suggestions on leading a balanced life. The outline of this program for the masses is designed in consultation with community people, sponsors and head of institutions. BrahmYog, the ingenious yogic studio offers effective healing and healthy living workshop at a nominal fee. Ramagya Sports Academy proudly introduces its "HEALTH AND FITNESS" section with a new look under its banner. 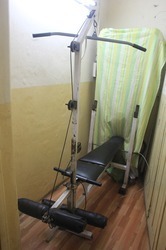 It houses the best and the latest equipments with certified trainers for all age groups and various regimes. The trainers take care of everything right from cardio and weight trainings to fitness assessment and testing. Motor Skills and Coordination like hand-eye coordination is very important to the healthy growth of a child. Also alertness and energetic behavior is very important at early years so they can continue the same spirit in their future. Playing games and enjoying events helps in healthy growth of a child. Physical fitness is often defined as being able to carry out one's daily routine and still have enough energy left over for other activities or events.